FINDING of a Court of Inquiry, held, at Cape Town on the 4th, 5th, 12th, 18th, and 19th days of May, 1911, into the circumstances attending the wreck of the s.s. " HELLOPES," which struck a reef in the vicinity of Oubeep Point, about six miles south of Port Nolloth, on 14th April, 1911. The British registered steamship " Hellopes," registered tonnage 1,797, owners Messrs. R. P. Houston & Company, of Liverpool; master, Thomas Grosart, left Cape Town on the 13th April, 1911, with a general cargo for Port Nolloth and German South West African Ports. She carried a crew of 41, and 14 passengers. The ship appears to have been well found in every respect; all compasses, books, and charts necessary for navigation were provided. She struck an obstacle some 19 feet below water the ship drawing 20 feet ”at 11 a.m., ship's time, on the 14th April, 1911, upon which she remained fast for some minutes. She was got off with her own steam and proceeded to Port Nolloth some six miles distant, where a portion of the cargo was salved. She was subsequently brought to Cape Town with her own steam. The casualty was fortunately not attended by loss of life or injury to any person. At noon on the 13th April, the position of the ship was latitude 33° 13' S. and longitude 17° 58' E. The course was N. 36° W. true-the compass error being 29° W. the patent log showing 50 miles. At 0.50 p.m., off Schooner Rock, the course was changed to N. 14° W. true, the log showing 58 miles error 29° W. This course was continued to 6.15 a.m. on the 14th, when the course was changed to N. 7° W. True the log showing 240 compass error 27 ° W.
At 8 a.m. it was changed to N. 12° W. true-the log showing 257 compass error 27° W. At 8.27 a.m., the course was N. 12° W. True log 263 compass error 27° W. At 9 a.m., N. 7° W. True log 268 compass error 27° W. Buffels River Beacon was abeam at 9.30 log 273. At 10.15 a.m. the course was N. 12° W. truelog 282 compass error 27° W. At 10.30 the course was N. 17° W. True log 285. This course was continued until the ship struck. This course as laid down on the chart would have brought the ship within 1½ miles of the shore, and had this course been actually made good the Court would have come to the conclusion that the navigation of the ship had been faulty. The point at which the master at first said the ship struck, and as shown, was at least four miles from the shore. He accounts for the discrepancy by the set of the current off shore, having allowed for an outset which, in accordance with all the evidence, appears to exist. All the evidence apart from this goes to show that the courses actually steered might have been considered safe. The witnesses all agree that the ship was navigated, at any rate as long as land was visible, at a safe distance from the shore. Breakers were not at any time heard. The master naturally desired to keep within such distance of the land as would enable him to check his position by leading landmarks. At 8.27 a.m. when Gourop Beacon was abeam, the second officer obtained a bearing of Buffels River Beacon, the result of which placed the ship seven miles off shore, and the steering from that point should have taken the ship clear of a 1 known outstanding obstacles. At 10.15 a.m. a thick, though intermittent, fog set in, we have no doubt that at that time the ship was in what might be assumed to have been a safe position, and the course thereafter steered should have been a safe one. The fog does not appear to have led up to, or to be connected with the casualty. The statement of the master that twenty per cent. of his navigation on this coast is done in fog is confirmed by the experience of one of the nautical members of the Court. We consider that the master might have been more prudent had he himself taken bearings where possible and used the lead as a safeguard in case of his being inshore, but at the same time we think that the result of such bearings and soundings would under the circumstances not have enhanced the safety of the ship. The bearings would have placed him in a presumably safe position, and the use of the lead, with the scanty soundings marked, would not have been of much use, and a look-out would not have been of assistance. It appears to us that the evidence goes to show that the ship struck an uncharted obstacle some distance from the shore, and that, subject to the above qualifications in regard to the master, no blame can be attached to him or to the officers of the ship; generally, he appears to be a careful and competent navigator, and the ship's books and papers are in proper order. Up to and after the casualty good order and discipline were maintained on the ship. When the ship struck soundings were taken alongside, with the result given by the second officer in his evidence. We do not attach importance to the evidence given on this point by a passenger. "The master of the German sailing ship 'Ostara,' bound from Swansea to Port Nolloth, has reported that on the 8th instant, at 4.45 p.m., his vessel struck what are presumed to be sunken and uncharted rocks, about six miles off the coast, in latitude 29° 43' S., and longitude 16° 56' E., about 45 miles south of Port Nolloth and due west of Milkbosch Point, or thereabouts." If the position of these rocks is correctly stated as being in latitude 29° 43' S. and longitude 16° 56' E., they could not be the obstacle which the " Hellopes " struck. But the positions given in this notice are so inconsistent, that it is impossible to locate them. We do not consider that the casualty was the result of any default on the part of the master and others concerned, and their certificates are returned to them. Dated at Cape Town this 19th day of May, 1911. IN the matter of a Formal Investigation held at Liverpool on the 13th, 14th, 15th, 18th, 19th, and 21st days of March, 1912, before STUART DEACON, Esquire, Stipendiary Magistrate, assisted by Captain J. H. WALKER, Captain C. B. GRAVES, F.R.G.S., and W. H. BRODBICK, Esquire, M.I.Mech.E. (Engineer Assessor), into the circumstances attending the loss of the British steamship " HELLOPES " in Mount's Bay, Cornwall, on or about the 21st December, 1911. The Court having carefully inquired into the circumstances attending the above-mentioned shipping casualty, finds for the reasons stated in the Annex hereto, that the loss of the " Hellopes," whilst on a voyage to Falmouth to be broken up, was brought about by a list which the vessel first took when off the Smalls on the 20th December last, and which gradually increased until it had, at the time the vessel passed the Longships, about 8 a.m. on the 21st December, developed to such a dangerous extent that the vessel was headed for Mount's Bay, and was there abandoned by her crew, when nearly on her beam ends. The vessel very shortly afterwards heeled right over and foundered. The list was first caused by a shifting of the cargo of coal when the vessel was off the Smalls during a freshening westerly gale with a high beam sea, and it gradually increased and caused the foundering because of the vessel making water in her holds, combined with a further shifting of the coal. The evidence before the Court was insufficient to definitely determine at what part of the hull the water entered, but the Court is inclined to believe that the water may hove entered through an insecurely fastened or damaged portlight on the port side of the 'tween decks. The Court does not consider that the master or any other officer of the ship has shown any default or want of reasonable care in the navigation of the ship. Dated this 21st day of March, 1912. This Inquiry was held in the Magistrates' Room, Dale Street, Liverpool, on the 13th, 14th, 15th, 18th. 19th, and 21st days of March, 1912. Mr. J. Paxton (Messrs. Avison, Morton, & Paxton), appeared on behalf of the Board of Trade; Mr. A. T. Miller (instructed by Mr. Vincent Downing, of Falmouth), represented the owners of the vessel, Messrs. Harris Brothers; and Mr. L. S. Holmes (Messrs. Miller, Taylor & Holmes), appeared for the master, Mr. Edward Rooney. The chief officer, Mr. William Dimble, and the chief engineer, Mr. Vooght, appeared in person, but were not professionally represented. Mr. S. W. Dod watched the case on behalf of the British and South American Steam Navigation Company, Limited, the previous owners of the "Hellopes." 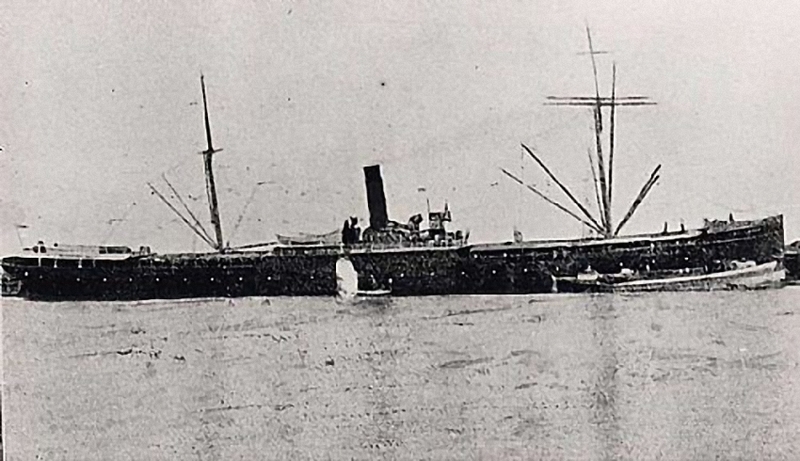 The " Hellopes," Official Number 96308, was a British screw steamship, built of steel, at Port Glasgow, in 1889, by Messrs. John Reid & Company, and her respective dimensions were: Length, 320-4 feet, breadth, 40-15 feet, depth in hold from tonnage deck to ceiling at midships, 25-7 feet, her gross tonnage being 2774-30 tons, and her registered tonnage 1797-49 tons. She was clincher built with two decks, was schooner rigged with two masts, and was propelled by one set of triple expansion direct-acting surface-condensing engines, made by Messrs. Rankin & Blackmore, of Greenock, having inverted cylinders 24 by 40 by 64 inches diameter, and a stroke of 45 inches. She had two steel double-ended boilers having a working pressure of 160 Ibs. per square inch. They were fired at the forward and after ends in separate stokeholds. The nominal horse power was about 287 and the indicated horse power 1500, the speed of the vessel when new being about 11½ knots. The pumping arrangements in the engine room consisted of two bilge pumps driven by the main engines from the air pump levers, one ballast donkey pump, and one duplex pump, all being connected to draw from the engine room and stokehold bilges. ballast tanks, hold wells, and from the shaft tunnel well. There was also a bilge injection connection for pumping from the engine-room bilges only. There were only two other suction pipes in the engine-room bilges, these being placed at the after part, one in each wing. There was a water-tight door on the bulkhead at the after end of the engine room leading to the shaft tunnel, also two sluice valves for allowing any water that might accumulate in the after hold to run into the engine room. There was also a water-tight door on the bulkhead which separated the forward stokehold from the cross bunker which was used for trimming coals into the forward stokehold, but it was stated in evidence that this door was not opened during the voyage in question, as all the coal required for the main boilers was taken from the side bunkers. The vessel had the usual sounding pipes to the holds, wells, and ballast tanks, also the usual deck pumps, all of which were stated to be in good order. The engine room and boiler casings were about seven feet high, fitted with fiddley gratings over the forward and after stokeholds, two side doors at the entrance of same, and two side doors into the engine room, the coamings for these doors being about 18 inches above the deck. There was an alleyway on each side of the casing about four feet wide between the said casing and the officers' and engineers' accommodation. At the forward end of these alleyways doors were fitted, but there were no doors at the after ends. On the port and starboard side of each alleyway and nearly abreast of the main funnel were two coal shoots leading into the side bunkers, and in each of these shoots a side door was fitted for trimming purposes, the coamings for the same being about 18 inches above the deck. According to the plans produced, the capacities of the permanent bunkers, which were in way of the engine room and boiler space, were:â€”Starboard side bunker in engine room between decks, 43 tons, lower bunker, 62½ tons, port side bunker in between decks, 23½ tons, lower bunker, 17 tons, starboard side bunker in boiler room between decks, 55½ tons, lower bunker, 60½ tons, port side bunker in between decks, 55½ tons, and lower bunker, 65½ tons. It was stated in evidence that no coal was in these 'tween decks as the lower bunkers contained sufficient for the voyage to Falmouth. She had five water-ballast tanks Nos. 2 and 3 being divided longitudinally for trimming purposes and an after peak tank, their total capacity being 616½ tons. She had five water-tight bulkheads, and was pierced and fitted with port lights in the 'tween decks for the carriage of livestock. This vessel sustained damage to her stem and bottom plating forward, in way of Nos. 1 and 2 ballast tanks, through stranding on the coast of South Africa on the 14th April, 1911, and was taken to Capetown where temporary repairs were effected. These were surveyed by Lloyds' surveyor at that port and considered satisfactory, and a provisional certificate of seaworthiness (which was produced in Court) was granted her, permitting her return to England in ballast, where she arrived safely in due course. She was dry docked at Birkenhead on the 28th and 29th July last, when her then owners, the British and South American Steam Navigation Company, Limited, decided to dispose of her as she stood, and in the beginning of December last she was purchased by Messrs. Harris Brothers, of Bristol and Falmouth, for £4,450, for breaking-up purposes. Prior to the transfer of ownership, the "Hellopes" was again dry docked and surveyed by Mr. S. A. G. Nash, one of the surveyors to Lloyds' Registry at Liverpool, who gave a certificate of seaworthiness for a voyage to Falmouth, with a cargo of coals. Mr. Nash stated in evidence that he had carefully surveyed the "Hellopes" internally, and also the external repairs effected at Capetown, and was fully satisfied that she was in a sufficiently good condition as to her hull and equipment to make a voyage from Liverpool to Falmouth. Later she was moved to the Stalbridge Dock, Garston which dock is the property of the London and North Western Railway Company for the purpose of loading a cargo of Lancashire screened house coal. During the process of loading, which commenced on the 13th December and was completed on the 19th December, the vessel listed heavily to port on one occasion, which certain witnesses attributed to the crankness of the ship, but which was proved to the satisfaction of the Court to have been mainly caused by a mistake on the part of the second engineer in pumping out the starboard side only of one of the longitudinally divided ballast tanks. To this amount 130 tons out of an estimated quantity of 150 tons of bunker coal remaining on board at the time of the purchase of the vessel has to be added, making a total weight of 3,527 tons of coal on board when the vessel left Garston. It was stated that 20 tons of coal had been used while in port. The " Hellopes " left Garston Dock at 10.20 a.m. on the 19th December, and came to anchor in the river in order that the trimmers of the coal might complete their work in the No. 5 hatch. This was finished at noon and the men were taken off by a tug. At 2 p.m. the anchor wau weighed and the vessel proceeded on her voyage to Falmonth in charge of a Mersey pilot. The draft on sailing was 22 feet 10 inches forward and 23 feet aft, and the crew consisted of 16 hands all told. The pilot left the ship at Point Lynas at S p.m. the same day, and he said in Court that when he left the ship, she was practically upright and everything appeared to be in proper order. The vessel was off the South Stack at 10.30 p.m., and at that time it was blowing hard from the south-west with a high head sea. At 6 a.m. on December 20th Bardsey Island Light was abeam, and the weather was then worse, with the wind and sea on the starboard beam. At 1.20 p.m. on this day the Smalls Lighthouse was passed, and at this time a freshening west-north-west gale prevailed with a very high beam sea. About this time a heavy sea struck the vessel on her starboard side causing her to lurch heavily to port, and from this heavy lurching the vessel never entirely recovered, as the coals in the holds had doubtless shifted to port. This list was at first not of a serious nature, although the evidence on this point was very conflicting. It seems fairly evident, however, that the list was from three to five degrees at this time, and there was nothing in this to cause the master to entertain any serious doubts as to the safety of his ship, therefore he did not then consider the advisability of seeking a port of refuge. During the afternoon and evening of this day the weather got worse and the sea increased, and owing to the list, water was continuously breaking aboard over the low side, sweeping along the port alleyway amidships, and from there finding its way below into the engine room and stokehold. At about 10 p.m., so much water had got below that the vessel was brought head to wind and sea, to enable the engineers to pump it out more quickly. The bilge pumps became partly choked during this operation, therefore the chief engineer had a manhole door removed from the port side of No. 3 ballast tank, which was under the engine room, and by this means the water ran into the tank, and was then dealt with by the ballast donkey pump. The chief engineer stated in Court that when this manhole door was removed the tank appeared to be quite free of water, and he also stated that never at any time was there a dangerous amount of water in the engine room or stokehold, until shortly before the vessel foundered. About midnight the vessel was put on her course again, but the list was very little less, and at this time it amounted to about nine degrees and continued to increase. At 2 a.m. all hands were called to secure things about the decks, and in particular the tarpaulins covering the No. 5 hatch, which had been partly torn away by the seas. Planks were then nailed over this hatch to further secure the tarpaulins, and, according to the evidence, very little water got into the hatch. The chief officer had been sent by the master, about the time when the vessel was head to wind, into No. 1 'tween deck to see if the coal there had shifted. He was able to get into this hold from the forecastle, and after his examination he reported to the master that this coal had not shifted. From 2 a.m., when all hands were called on deck, until the Longships was passed, between 7 a.m. and 8 a.m., the list to port increased to a dangerous extent. The weather was still very bad, the wind veering to the westward with blinding rain, and according to the evidence, the list, when the vessel was off the Longships, was about 14 degrees. It was therefore decided to run for Mount's Bay for the general safety, and it was whilst between the Longships and the Runnelstone Buoy that the position of the ship became very serious. Signals of distress were hoisted, and soon after passing the Runnelstone a steam trawler sent her boat alongside to take off the crew. Twelve of the crew left in this boat, and shcrtly afterwards the anchor was let go off the Mousehole in Mount's Bay. The vessel was now nearly on her beam ends, and the lifeboat from shore arrived and took off the master, mate, and the two engineers who had remained on board. About ten minutes after they left the vessel, she heeled right over and foundered. The above is the story of events on this voyage, as generally given by the various witnesses before the Court, but it must be stated here that the narrative as detailed by the master and mate before the Receiver of Wreck shortly after the disaster, and also as described by them in the extended protest dated January 1st, 1912, differed very considerably from the version given by them in Court. The main facts agreed however, and it was principally on points of time that the differences appeared therefore, the Court is of opinion that the foregoing account of events is substantially correct. There seems to be no doubt that this ship had sufficient stability. She had been employed for over 20 years in the South American and South African trades, and during that time had been loaded with all kinds of cargoes, including shipments of animals from the River Plate, which were usually carried in two tiers on the upper deck. Also, two statements were put before the Court, signed by two of the masters who had commanded the vessel at different times, and these bore testimony as to her stability under various conditions. There is also no doubt that the vessel was not loaded down to her winter marks when she left Garston. As to the question of trimming, the evidence before the Court was not very clear, although it was, of course, all given by men who were more or less responsible for the work. The loading and trimming of the coal were carried out by employees of the London and North Western Railway, and the trimmers were on a daily rate of pay, and not on piecework; also, ample time was occupied in the loading, therefore there seems to be no apparent reason why the trimming should not have been properly done. All the witnesses stated that it was well done, but on going into the space which would be occupied by this Lancashire coal, even allowing 47 cubic feet to the ton, it would appear that the various compartments were not so full as was stated to be the case. Against this, however, there is the fact that in an old ship such as this, there would be a large amount of old gear, dunnage, &c., which would occupy considerable space. The Court therefore concluded that, although apparently properly trimmed in the usual manner, the coal was not so well stowed under the decks as it might have been. The list which eventually led up to the loss of the ship, was undoubtedly started by the heavy beam sea which was encountered off the Smalls, but the causes which developed this list to a dangerous extent, are not so well defined. During the night of the 20th December, a quantity of water found its way into the engine room and stokehold, but not in any great volume, and this was successfully dealt with by the pumps. The gradual nature of the increase of the list, and the description of the events as given by the various witnesses, led the Court to conclude that water was finding its way into the holds, but there was no evidence as to where this leak occurred. The temporary repairs effected in Capetown were all connected with the bottom plating and did not extend above or beyond the double bottom, therefore if any leakage had occurred there, it would only have filled those particular ballast tanks, and it was stated in Court that soundings were regularly taken, as far as was possible with seas breaking over the decks, and no water was found in the tanks. The most likely explanation, therefore, seems to be that a port-light on the port side in the 'tween deck was either insecurely fastened or became damaged before the vessel left Garston, and that when the port-lights became partially submerged as they would do when the list was started, and as it increased, wholly so the water would get into the port side of the 'tween decks and would cause the very heavy list to develop, which ended in the vessel heeling right over and foundering. Also the coal would, no doubt, surge more to leeward as the list increased. Many instances are on record where serious damage and loss have occurred through a 'tween deck port being left open or becoming damaged, and it is possible that someone at Garston may have opened a port to get air and light whilst the coal was being trimmed, and afterwards have either forgotten it or not securely screwed it up. It is only right to add that nothing to support this theory of the Court appeared directly in the evidence. 1. What were the circumstances in which the vessel became the property of Messrs. Harris Brothers? What was her value when she last left Garston? What insurances were effected upon and in connection with her? (a) Was she in good and seaworthy condition as regards hull and equipments? (b) Was the cargo properly stowed, trimmed, and secured from shifting? Were proper measures taken by the master and chief officer to ensure that this was done? (c) As laden, had she sufficient stability? (d) Had the vessel the required freeboard, and was she upright and in good trim for the voyage to Falmouth? 3. What was the cause of the vessel listing to port about 1.30 p.m. of the 20th December? Was every reasonable effort made to get her upright? Should the master then or later have turned back or made for the nearest port? 4. What was the cause of the list to port increasing considerably during the night of the 20th/21st and the morning of the 21st December last? 5. What was the cause of water getting into the engine room, and was every possible effort made by the chief engineer to keep it under? 6. Did the vessel make any water in her holds, and, if so, what was the cause of it. and were proper efforts made to keep it under? 7. When and where was the vessel abandoned, and what was her condition and the condition of the weather and sea at that time? 8. What was the cause of the loss of the vessel? 9. Was the vessel navigated with proper and seamanlike care? 1. The circumstances in which the steamship " Hellopes" became the property of Messrs. Harris Brothers were as follows: The vessel originally belonged to the British and South American Steam Navigation Company, Limited, of Liverpool, and whilst their property, sustained damage through stranding on the coast of South Africa on April 14th, 1911. She was temporarily repaired at Capetown, after which she was granted a certificate of seaworthiness to proceed home in ballast, by Lloyd's surveyor. The vessel duly arrived in Liverpool, and was there dry docked for further examination, after which her owners decided to dispose of her. She was eventually purchased by Messrs. Harris, of Falmouth, one of the conditions in the contract being that a Lloyds' certificate of seaworthiness and fitness to carry a cargo of coals to Falmouth be obtained, after delivery of which, the buyers also undertook to break her up. The purchase price was £4,450, which was her estimated value when she sailed from Garston. The insurances effected upon and in connection with her were as follows: Hull and machinery, £5,000, Cargo, £3,500, also premiums amounting to £24 5s. Od. were paid to cover employer's liability, and sundry other items. (a) The Court, having regard to the vessel's mishap off the coast of South Africa and the temporary repairs done to the vessel to enable her to proceed to England, is unable to say that she was in good condition, but there is nothing in the evidence to show that she was not sufficiently seaworthy, as regards hull and equipment, for the contemplated voyage to Falmouth. (b) The cargo appears to have been stowed, trimmed, and secured from shifting in the manner usually adopted by steamers, but the Court, having regard to the space occupied by the cargo, is of opinion that more vacant spaces existed in the holds than the evidence actually showed. The master and chief officer did supervise the trimming of the cargo to the best of their ability. (c) As laden, the vessel had sufficient stability. (d) The vessel had the required freeboard and was not loaded to her winter draft. She was upright and in good trim. 3. The cause of the vessel listing to port about 1.30 p.m. on the 20th December, was the cargo shifting, after the ship was struck by a heavy sea on the starboard side whilst rounding the Smalls. Nothing was done at this time to get her upright, the list not being of a serious nature. At this time it was not necessary to turn back, or make for the nearest port, and at a later stage in the voyage, when the list, and also the wind and sea from the north-west, had greatly increased, it would not have been prudent to do so. 4. The probable cause of the list to port increasing during the night of the 20th and the morning of the 21st December, was water getting into the vessel, and a further shifting of the coal. 5. The cause of the water getting into the engine room and stokehold was the heavy seas breaking over the low side of the vessel, flooding the port alleyway, and from there, finding its way below. The chief engineer made every effort to keep the water under. 6. After passing the Smalls, the Court is of opinion that the vessel did, undoubtedly, make water in her holds, and the cause of her so doing was probably either the springing of a leak through the heavy straining of the vessel or that a port light on the port side had been insecurely fastened or damaged and which became submerged owing to the list. No efforts were made to keep the water under, which the Court attributes to the fact that the presence of the water was not detected under the conditions prevailing. 7. The vessel was abandoned at noon on the 21st December last, at a point about 1½ miles due east of Mousehole, Mount's Bay. She was then nearly on her beam ends, and, about 10 minutes later, was seen to heel right over and sink. The weather was still very bad, with a broken sea, and the rescue of the crew was attended with considerable difficulty. 8. The loss of the " Hellopes " was primarily due to the shifting of the cargo of coal to port during an increasing westerly wind and sea, and ultimately through the vessel making water in her hold at a place which, from the evidence before the Court, could not be definitely determined, and which resulted in the vessel turning over on her beam ends and foundering. 9. The vessel was navigated with proper and seamanlike care. 10. The loss of the steamship " Hellopes " was not caused by the wrongful act or default of the master, chief officer, chief engineer, or any of them.